Wait! I know what you’re thinking…Seaweed of the Month Club? Are you joking? No, I am not. Please just humour me with the next 2 minutes of your life so that I can state the case for the delicious delicacies of the sea. I am proposing to introduce all of you to the wonders of sea vegetables, one at a time, in hopes that you will also fall in love with what the ocean has to offer in the way of foliage. Seaweed, or as I prefer, sea vegetables, deserve some major attention, seeing as they collectively have all fifty-six minerals and trace minerals deemed necessary for the human body. They are loaded with calcium, iron, protein and dietary fiber; they are low in calories and naturally fat-free. Sea vegetables also contain the illusive vitamin B12, which is rare in plant foods, and therefore a great choice for vegetarians! I am sure that most of you have eaten sea vegetables before. After all, it is one of the major ingredients in sushi. That black “stuff” the rice is wrapped with is a sea vegetable, called nori. Some of you braver souls may have even tried the “seaweed salad” that Japanese restaurants often serve, made of wakame. Seaweed really isn’t that scary, just different from what we’re used to. It is consumed mainly in Japan and China, where it has been a staple food for thousands of years, but over here in North America, we seem a little timid to adopt such an unfamiliar fodder. Well, I am officially putting an end to that. Over the next few months, I will show you many ways to incorporate the wide variety of sea vegetables into your diet. Aren’t you lucky? Arame is a good place to start since it is one of the milder tasting sea vegetables on the market. 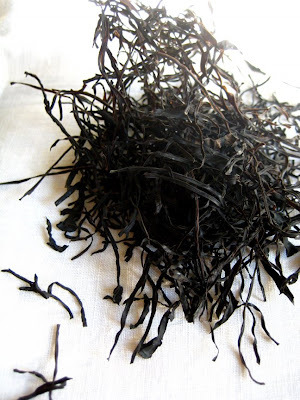 It is a dark, almost back seaweed, with stringy texture. Before it is packaged, it must be cooked for seven hours, and then dried in the sun. To use, simply re-hydrate by soaking it in room temperature water for 15-20 minutes until it is soft and has doubled in volume. Arame is very high in calcium, iron, potassium, vitamin A and the B vitamins. 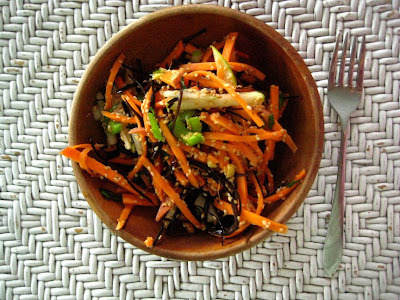 I like to add arame to my salads, soups, and stir-fry’s. It adds a lot of nutrients, without an overpowering flavour. 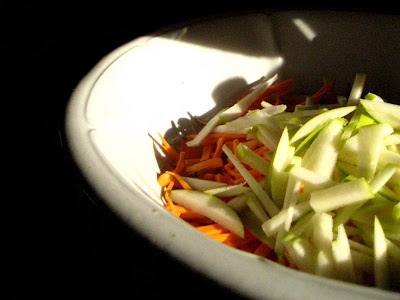 I learned how to make this salad at a cooking class last year, and it quickly became a dinner staple in my house. You will undoubtedly be surprised at how tasty raw sweet potato is, and the toasted sesame seeds add a delicious, familiar flavour. I like to serve this with a grain on the side, such as quinoa or brown rice. It is also great on picnics, as you can prepare the salad ahead of time. This allows the flavours to meld together, and the acid in the lemon juice helps to break down some of the starch in the sweet potato, making it softer. 6. Toast sesame seeds in a dry skillet until they begin to pop – careful, the burn quickly! 8. Toss all ingredients together and enjoy! Stayed tuned next month when I introduce you all to the next sea vegetable on our list…Dulse! I can feel your excitement already. I’d love to learn even more. Bought a few packets of sea vegetables, but I’m unsure how to use them. Any chance of picking up this series again? It would be so appreciated. Interesting! 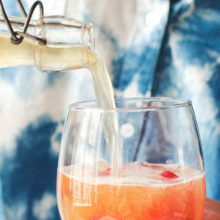 Can’t wait to try it. …and Lie groups do not include essential symmetry parity for its becoming totally discontinuous. Fermionic matter-based vacuum parity experiments threaten the full of physics, as Mercury’s excess perihelion precession doomed Newton. The SM is a 26 parameter curve match. SUSY is empirical hornswoggle. Mirror-symmetric fermionic make any difference theories are furies of parity violations met with manually inserted hierarchies of symmetry breakings none of which extrapolate. Dark subject re the galactic Tully-Fisher partnership is Wesley Crusher physics. awesomeness, been waiting a while for this one. Look forward to the next post!